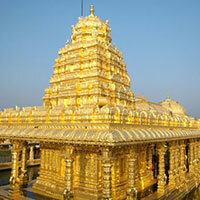 Arrive at Tirupati Airport / Railway Station transfer & Check in to Hotel. 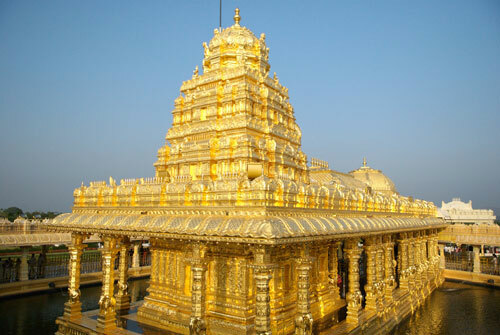 Tirupati is a pilgrimage destination in Andhra Pradesh,famous for Lord Venkateshwara (Balaji) Temple visited by millions of tourists every year. Situated in the Chittoor district surrounded by Tirumala Mountain Ranges, Tirupati is one of the most famous shrines in the country. Today is day for darshan to lord Balaji at Tirumala, Akasa Ganga, Papavinasam, Silathoranam, Japali Theertham. Overnight stay at Tirupati. After morning breakfast transfer to Vellore for visit Golden Temple, Kanipakam, Ardhagiri, Ratnagiri Balamurugan Temple, Chandragiri Fort. Overnight stay at Vellore.